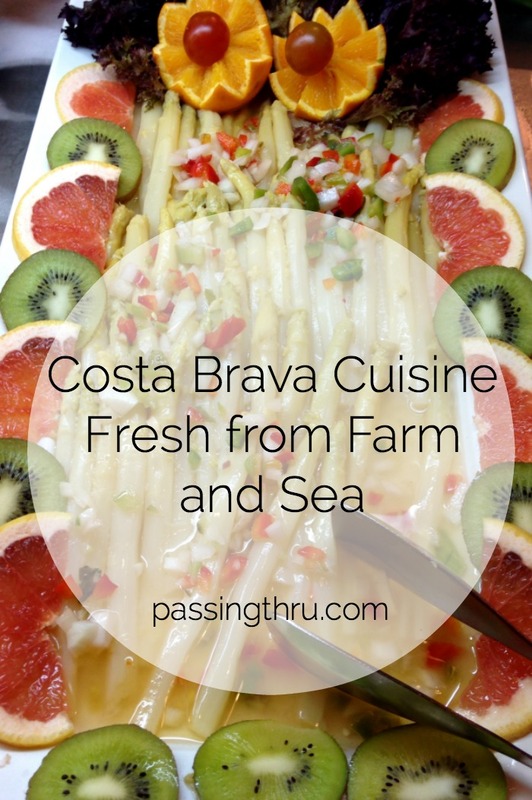 Simple ingredients fresh from farm and sea make for magical meals of Costa Brava cuisine at traditional tables in Catalunya. If a society’s overall well-being is reflected in its everyday food, Catalunya may just be the finest place on the planet. In the Costa Brava, local food – its production, preparation, presentation, and ultimately, the pleasure taken from it – artfully elevates the experience of eating to entirely new levels. The Costa Brava region in northeast Spain stretches from the town of Blanes (about 40 miles northeast of Barcelona) all the way to the French border. Like other regions in Catalunya, it is divided into “comarques,” districts which might be best compared with counties in the United States. Each comarca has a capital city, but overall the divisions are non-official and sometimes ambiguous. We spent a week in the Baix (low, or south) Empordà comarca, which has a population of about 140,000 in an area of 435 square miles. Costa Brava made a name for itself as the residence of artists, intellectuals, and celebrities over the last 100 years, but at the turn of the current century, gastronomy took star cultural billing. Costa Brava began to draw serious food pilgrims to globally-rated restaurants which were creating avant-garde cuisine by reinventing local traditions. These outstanding culinary innovations have resulted in global recognition: Michelin stars a-plenty, and two out of the top 5 of the peer-voted World’s 50 Best Restaurants. 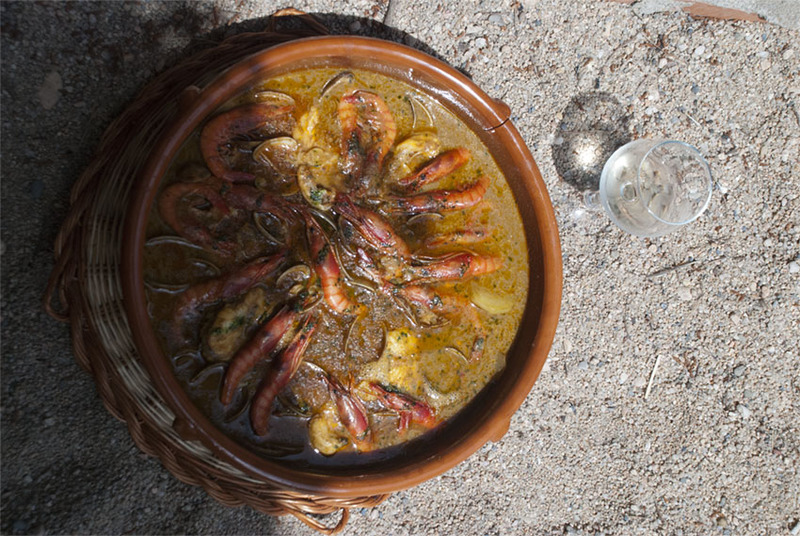 But sophisticated Costa Brava cuisine isn’t just for fancy people and places. 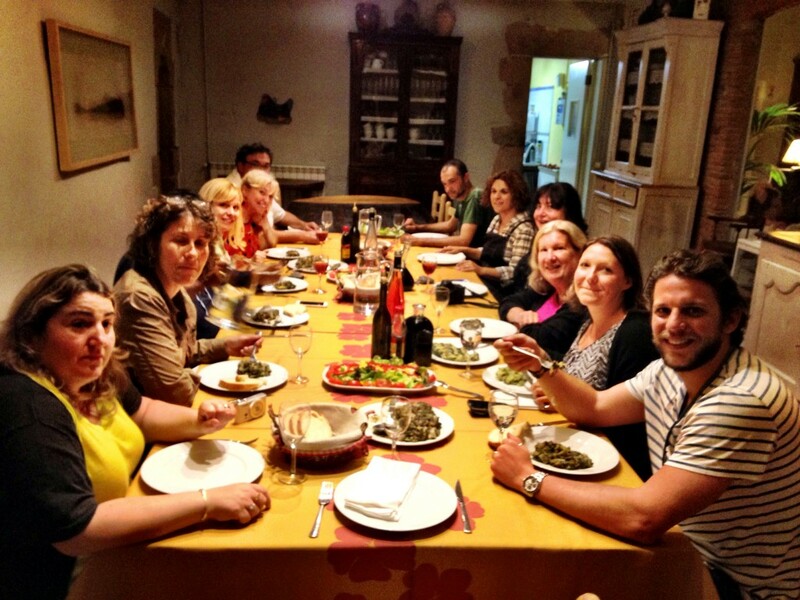 Virtually everyone we encountered in Spain appreciates and enjoys good food. Markets are teeming with fresh and salted fish, anchovies and prawns; meats are raised and cured using age-old Iberian processes; vegetables, fruits, and rice are organically grown; there are mind-boggling assortments of olives, oils and balsamic vinegars, flavored sea salts, breads and pastries, local wines and even herbal aperitifs (replete with alcohol, yay!) to assist the digestion. Prices are low, access is high. In a comprehensive array of brilliant experiences facilitated by Costa Brava Pirineu de Girona and Visit Empordà, we were treated to “cuina de la Costa Brava” – the cuisine of the wild coast. “Cuina rural” and “plats de mariscs” (seafood dishes) were prepared by “granger” (now there’s a word a Midwest farm-town girl like me would easily recognize) and “pescador” (“fisherman”) alike. 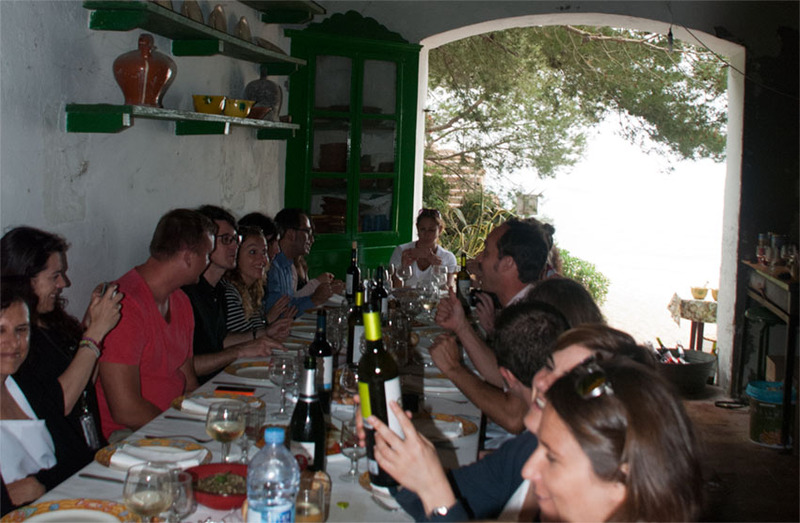 We consumed Costa Brava cuisine with pleasure, in very fine and authentic company indeed. Serenading us on this written journey of remembrance are two members of Tiramiu’s Society of Friends, with a traditional havanera. Click to listen as you read through! If you’re reading in email, here’s the video link. The Society of Friends in Tamariu Beach was founded by twelve pescadores in 1872. Membership has remained within the same dozen fishing families ever since. It is an honor to be invited for a meal in their clubhouse, a fisherman’s shack beside the sea. 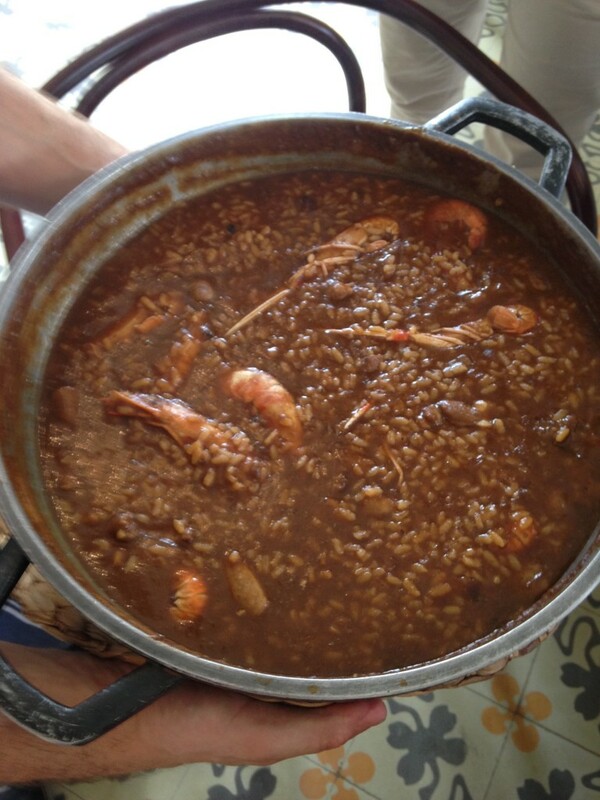 Pete’s group enjoyed “suquet de peix” – a fish stew, along with cremat (an aromatic rum). Eleven kilometers inland at the medieval village of Pals, Betsy’s group transitioned from sea to land by sampling a variation of this stew, bolstered by the addition of local rice. Pals began growing rice in the 15th century in fields which naturally flooded from area rivers. Production was interrupted in the 19th century when it was thought that diseases and epidemics sprang from the standing water, then reinstated when modern methods were brought back by Indianos returning from Cuba. Today, about 20 families grow seven varieties of rice around Pals using mechanized and traditional processes. The lovely Restaurant Antic Casino‘s menu included an appetizer of scallops with cream of leek and truffle oil before the main course of Pals rice casserole. 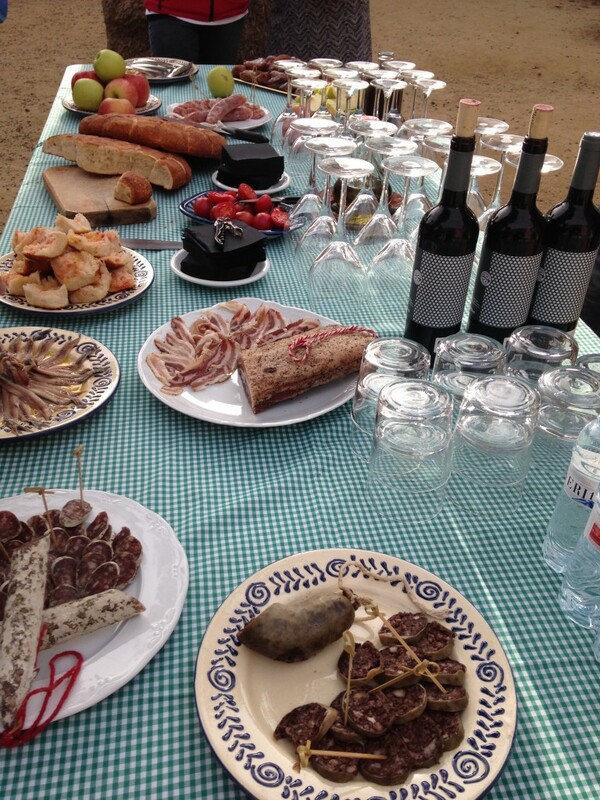 At El Museu de la Mediterranea in Torroella de Montgrí, Betsy’s group tasted more local products in a simple, yet gracious repast. Amid towering palms in front of what once was the residence of 19th century poet-politician Albert de Quintana i Combis, a table was set in the large open courtyard. It was timeless and beautiful. Between Peratallada and Pals, the landscape of the Empordà rivals Tuscany. 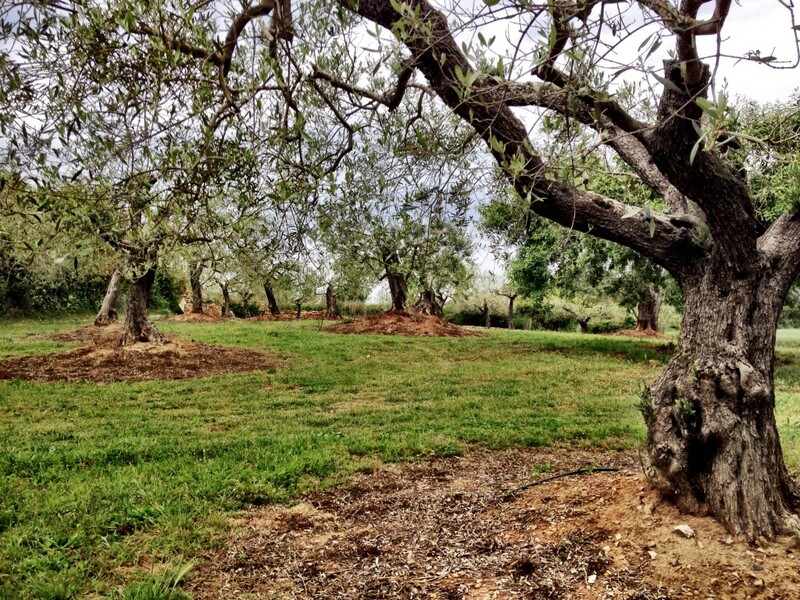 On another day, cycling up to a grove of olive trees six hundred years old or more, Betsy’s group came upon a humbling repast set in front of a house made of stone. 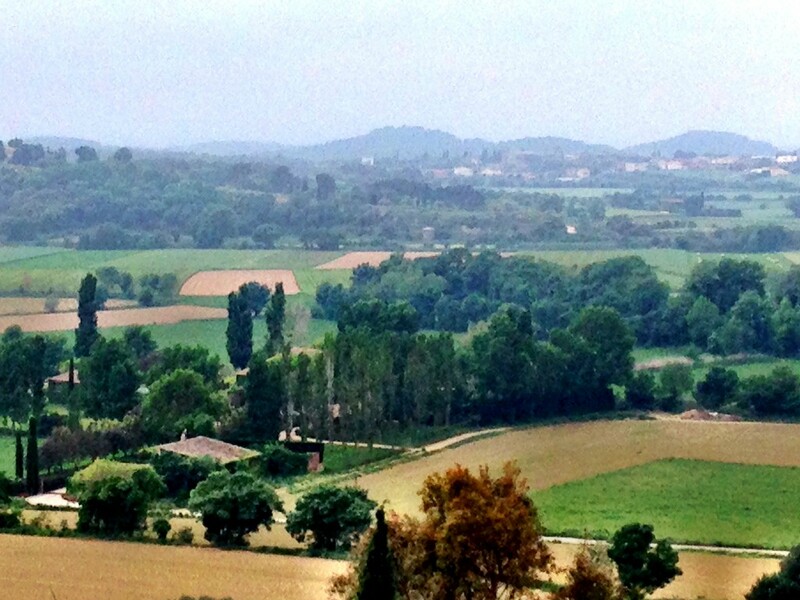 In the distance, over the tree tops in any direction, were church spires centered in medieval villages. 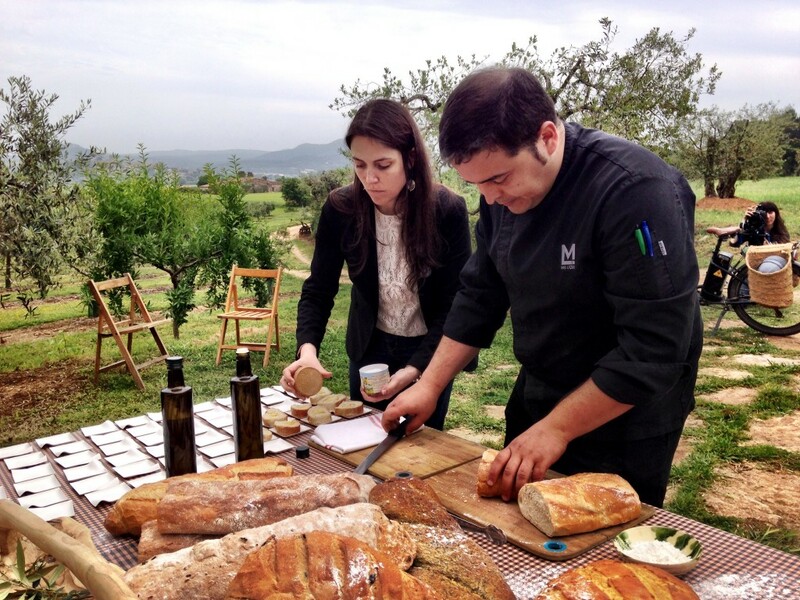 Zaida Godoy, and her award-winning chef Jordi Dalmau, from Mas Lazuli Hotel and Restaurant, had come from the village of Pau to teach us about bread. Jordi defines his cuisine as “the unconditional love of the excellence of fresh, organic and proximate products.” Later we learned Jordi had arisen at 4am that morning to bake the bread for our tasting. Seated on a low stone wall, a granger mixed up his grandmother’s recipe for aioli mayonnaise in a 19th century wooden vessel. A 19th century wooden vessel and recipe, with lots of garlic = pungent taste! Meanwhile, Jordi, who has worked in 3-star Michelin kitchens, briefed us on the basics of bread. During hard times in Catalunya, families were often reduced to little means. Bread was made in loaves sized to last several days. Olive oil and salt gave it flavor; slicing it the width of two fingers ensured precious toppings wouldn’t be wasted by spilling or seeping. Variations in mixing time and intensity aerate the dough from its natural denseness into a lighter product with a crust that bakes up crispier. When fruits, nuts and vegetables were available, they were incorporated to flavor. Wild herbs, such as fennel or rosemary, could be rubbed between the palms before eating to influence the sense of smell, affecting one’s taste. Out of great hardship and necessity in the past, came wonderful inventive solutions which influence gastronomy in the Costa Brava today. 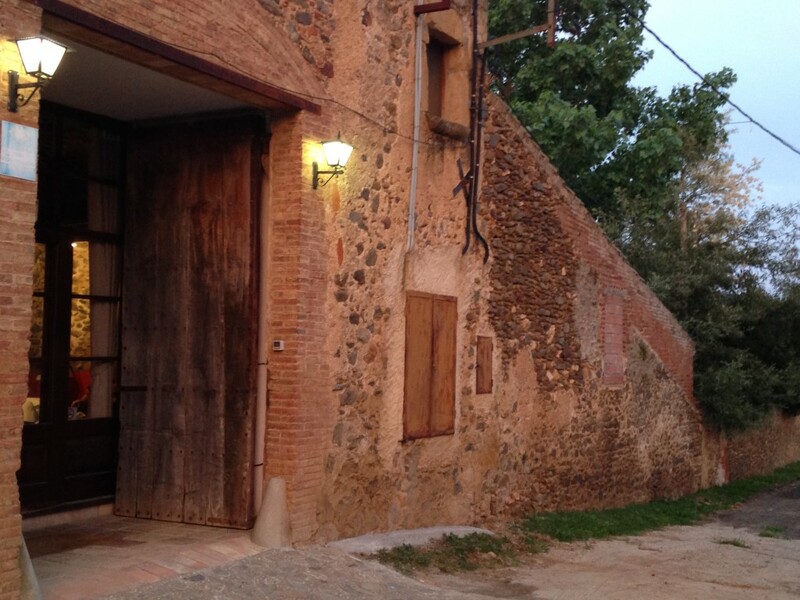 In the hamlet of Cruïlles, close by Baix Empordà’s capital city of La Bisbal d’Empordà, is a 13th century farmhouse at the foot of the Gavarres Hills. 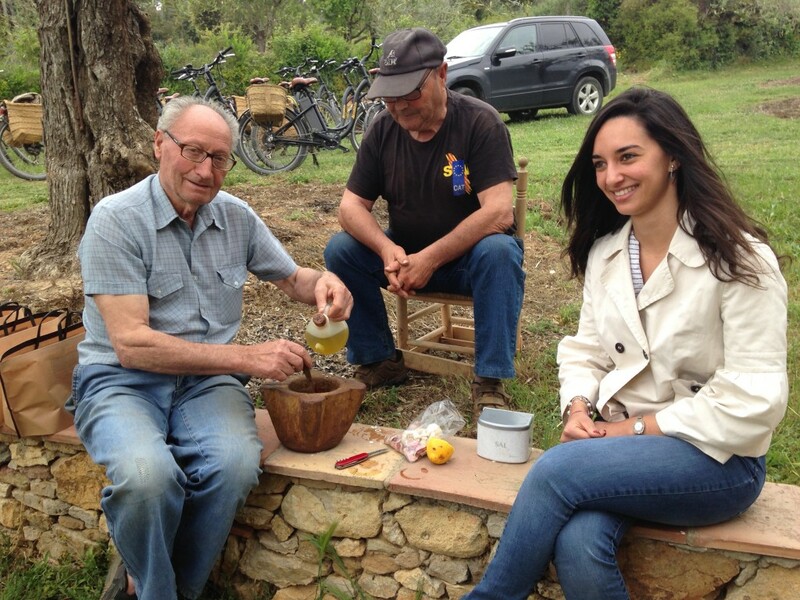 “Casa rural” Mas Masaller is the brainchild of Marta and her chef husband, Joan, whose Empordanese cooking emerges from a typical farmhouse kitchen to reign supreme at their long family-style table. 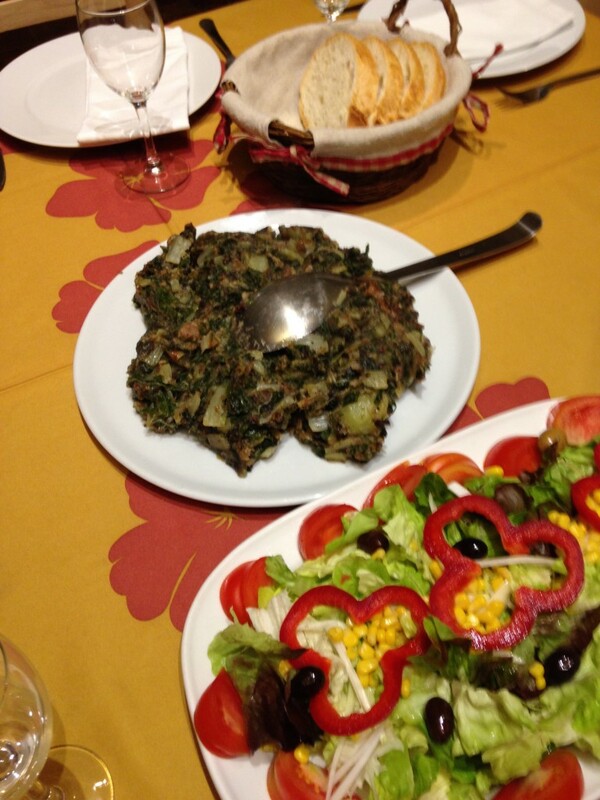 On the night Betsy’s group visited, the first course consisted of fresh green salad and a grilled potato and vegetable dish, called “escalivada.” This alone would have satiated us, filled with bread as we were. 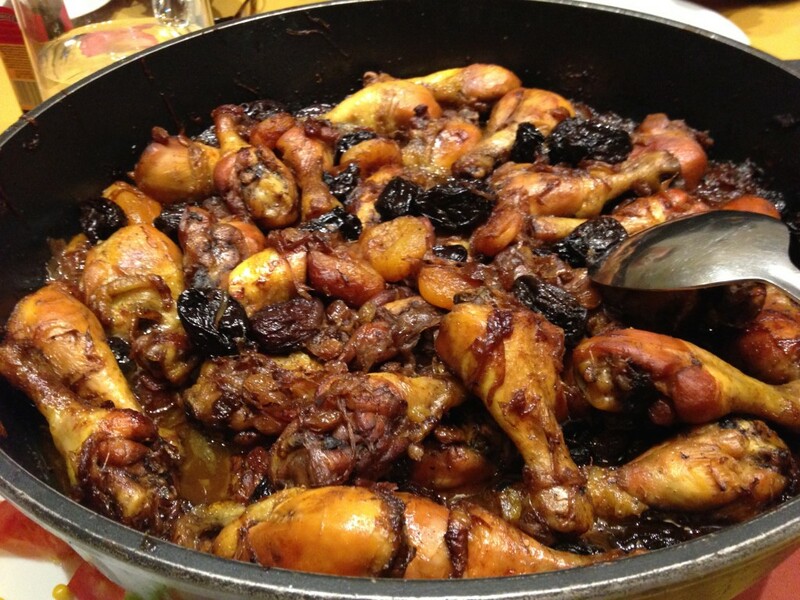 But the main came out and we couldn’t resist: a hearty pan roast of chicken drumsticks with prunes, apricots and onions. “Postre” (dessert) was a series prepared by friend, Mònica, who with her husband operates Mas Vilà, a similar accommodation in a 17th century farm cottage outside the village of Monells. 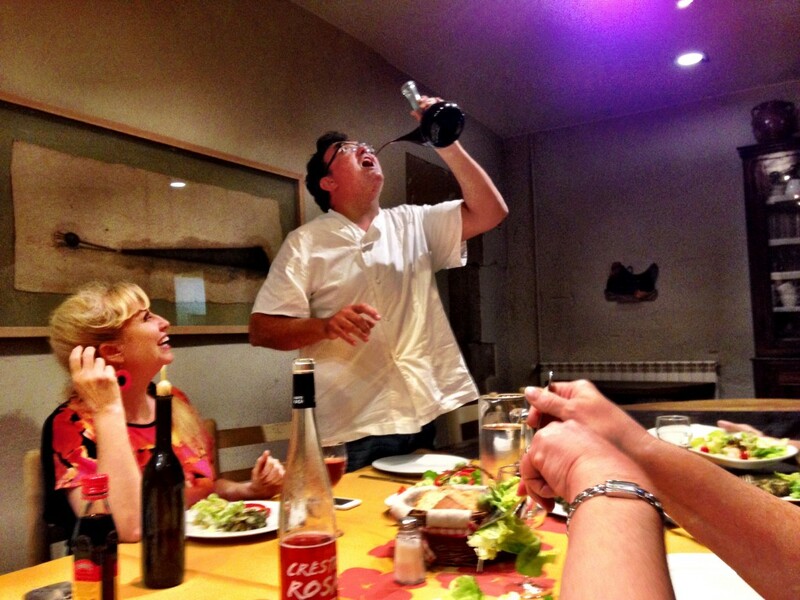 But the real entertainment came from Joan, who demonstrated the proper way to drink wine from a traditional Catalán vessel. We finished our last night together with happy smiles and full bellies. There’s this thing about Catalunya and the Costa Brava that people talk about. It’s a sense of being right where you are supposed to be in the skin that you’re wearing. It’s a function of living in the moment, of celebrating each day, of savoring the connection we as human beings crave in other places where life is less personal, of embracing joy and spirit. Salvador Dalí, who built a house for himself and fixed up a castle for his beloved here, famously said, “There are some days when I think I’m going to die from an overdose of satisfaction.” We understand what he meant now that we’ve been to the Costa Brava. If you’re lucky enough to be introduced to someone who is a member of the Society of Friends in Tamariu and they invite you to the fishing shack for a meal, move heaven and earth to get there. Antic Casino Restaurant, C/Enginyer Algarra, 32, 17256 Pals, tel. 636 99 38 83. Market and garden-based cuisine showcasing local products in a landmark building. Mas Lazuli Hotel and Restaurant, Carretera de Roses 17, 494 Pau, tel. (+34) 872 222 220. Six suites, one junior suite, 9 rooms and one apartment with panoramic views of olive groves and the Bay of Roses. Nightly rates range from 220€ in low season, includes breakfast. Restaurant Mas offers varying menus, including a chef’s carte blanche, and bespoke for groups of eight or more. Prices begin at 38€ for lunch and 48€ for dinner. Mas Masaller (Turisme Local), Rabioses, 5, 17116 Cruïlles (off Carretera de la Bisbal a Calonge, km 2, 3), tel. (+34) 972 641 301. Six en-suite bedrooms, free wifi, child and pet-friendly, pool and garden, adjacent to working farm. Double occupancy from 71€ (low season) to 90€ (high season). Triple and quadruple configurations for families available. Prices include breakfast. Dinner must be reserved ahead, 12-15€ per adult, less for children. Mas Vilà (Turisme Local), Veïnat de Sies (Monells), tel. (+34) 972 63 04 75. Accommodations include two apartments and a cottage for groups varying in size. Prices range from 230€ per weekend in low season to 1600€ per week in high season. With grateful thanks to Costa Brava Turisme Pirineu de Girona and Baix Empordà Turisme for coordinating these outstanding introductions to a world-class region, and their service partners listed above, who provided us with exceptional hospitality. All opinions are our own. Oh gosh I’ve just eaten but looking at and reading about all that good food makes me hungry again. Those olives and antipasto options look divine. 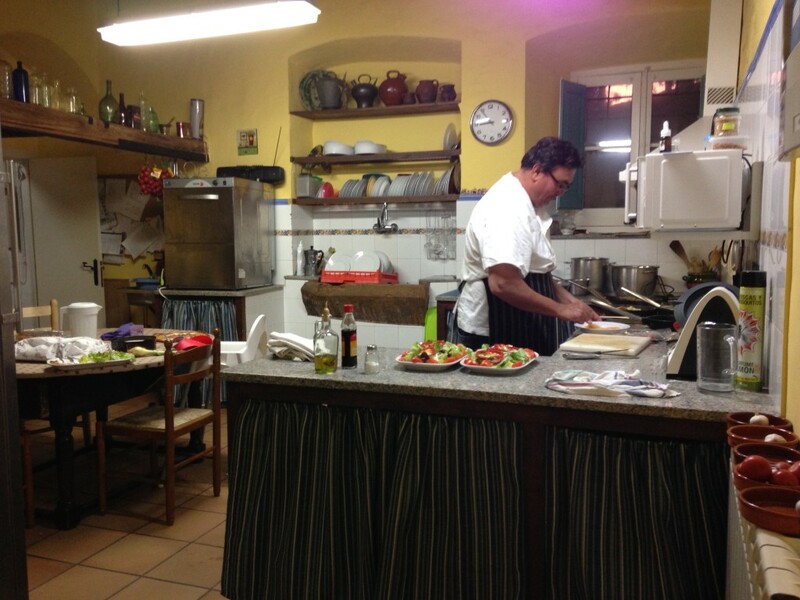 Hi Toni – The olive kebabs were a combination of salted cod, olives and other ingredients. I am not an olive fan, so it didn’t sound appetizing at all, but I decided to take one for the team. OMG!! It was amazing. Oh my goodness you dont waste a minute or centimeter squared in your tummies do you? I applaud you! And envy you a teeny bit. 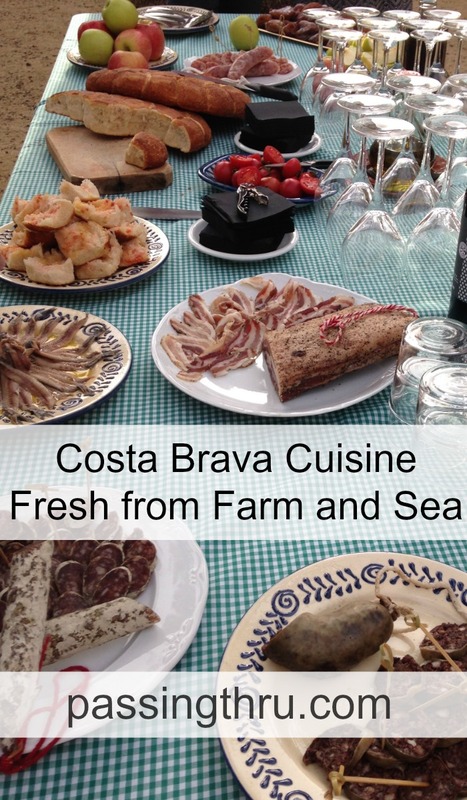 This Costa Brava trip seems simply delish. 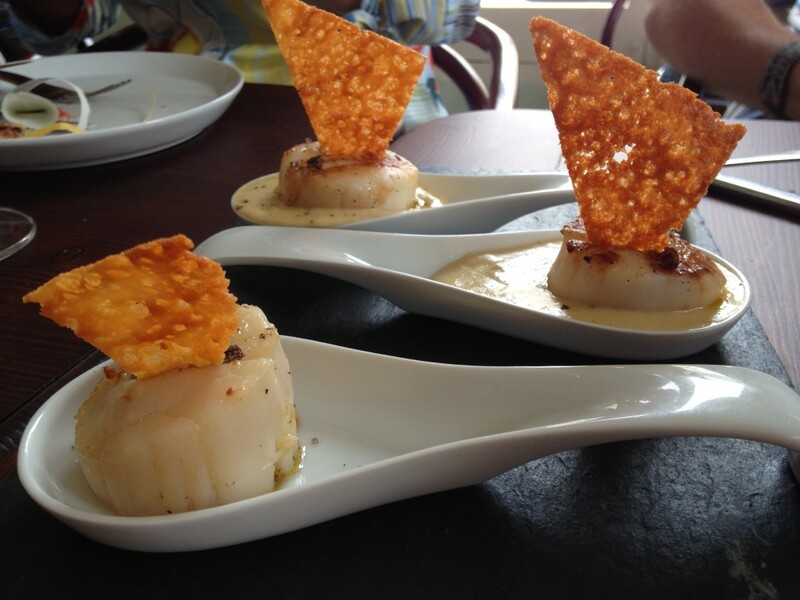 Wow – what wonderful experiences you had and the food looked amazing. I really loved my visit to Costa Brava. 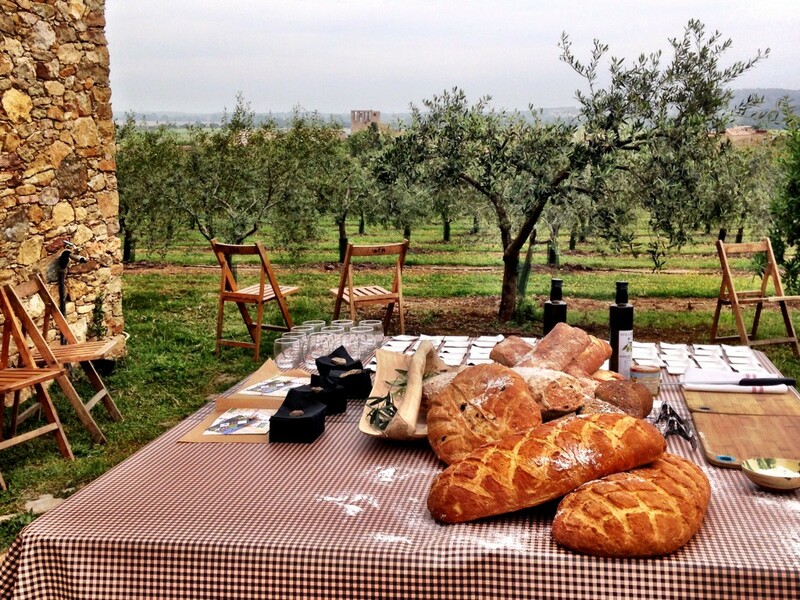 Beautiful scenery, great food, wonderful people – what more do you need? Hi Jennifer – it’s really tough to beat, isn’t it? A favorite destination of ours now. Yet again I have found a blog post about amazing food, right before I eat something boring by comparison! Hi Mary – LOL Thanks! Spain is hard not to like, for sure. Absolutely love the farm to table culture! Had no idea it was so prevalent in Costa Brava! Hi Revati – We’re big fans, too, and we’d like to return. I’ve been hearing a lot about Costa Brava, but hadn’t read much yet about the cuisine scene – everything sounds and looks delicious! Might have to try and make a friend who’s a member of the Society of Friends in Tamariu!! Everything looks so delicious and I see you met Nicolas, great guy! What a fabulous trip with incredible food, and entertainment. Antipasto is my favourite, and even though I can’t eat the bread … It looks amazing! Love all the farm fresh options and the seafood! What a fabulous resource. I was firstly attracted by the food, and then all the other snippets you provided. I think though you had me at the food 😉 Then again, I loved this quote, ” The Phoenicians taught us to cultivate the vine and the Greeks taught us democracy, the Romans bequeathed us their language and the Arabs their numbers and irrigation systems. . . Catalonia intervenes with its own voice in this common space.” And from what I’m seeing, that could be ‘food’! Gorgeous scenery and fresh food. Winning combo! Hi Charles – We certainly agree! wow, that is eating madness, I remember a visit to Girona two years ago and the food was amazing. I definitely need to explore more of these cities filled with foodie gems and eating extravaganzas. Hi Noel – “Eating madness” – love it! We would like to visit Girona; we never made it that far inland! What a mouth watering posting, helped by lots of beautiful photos. Makes one wish to have made that trip! Thanks for a great posting. Hi Denis – Thanks very much, glad you enjoyed it. All the food looks wonderful. Especially the bread and the seafood stew. I love think about ” a sense of being right where you are supposed to be in the skin that you’re wearing”. Great attitude. Hi Donna – Thank you. It’s hard to describe, but I think that phrasing does the trick. Wow! I don’t know where to begin! I started making a mental note to tell you which dishes look especially delicious and I lost count! I will be saving this link for future reference. Glad you had such a wonderful trip. What amazing food experiences and photos. We’re big fans of ea ting sustainably and from the farm. We try to do it both at home and when we travel. Hi Billie – Yep, there’s nothing better. And we really miss it where we are right now. What a wonderful post! I have been wondering where Costa Brava was. Fresh food from farm and sea to the table is probably their secret to long and good quality life. How long did you stay? Perhaps a month there would be good! I love the phrase “food pilgrim” and it looks like Costa Brava is the place to go on a feasting pilgrimage. 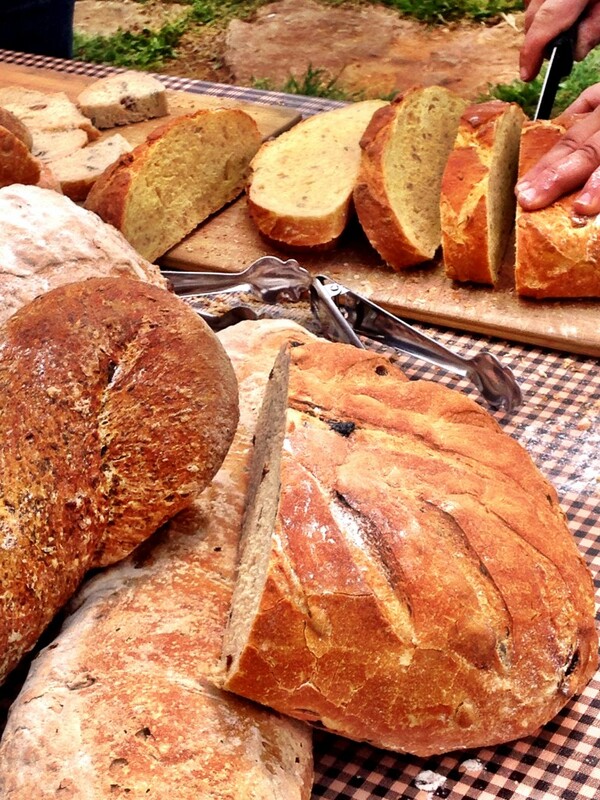 All of your food photos had me drooling but the pics of Jordi’s bread had me imagining the taste … Mmmmm! Hi Anita – Jordi is an amazing talent and we learned a lot from him. Not only did he get up at 4 in the morning to bake for us, but they delayed the opening of the restaurant to do this field trip on our behalf. You can bet we’ll try to visit the hotel and restaurant when we return. Oh man, I would say you picked the right post TBEX trip. Beautiful, tasty and Catalan. Priceless. Hi Suzanne – Between the two of us, we lucked out indeed. Now we just have to finagle a way back. Touches the heart, as you know. Thanks. I simply adore Catalonia for their food. Your experience, and this resulting epic post, are testament to the glories of their wonderful dining habits. Thank you for bringing it to life for us! I’m drooling looking at the seafood stew (and fruits, raisins and pistachios bread too!) Still trying to work out which photo to refer to for olive kebab though, btw. Hi RaW – You can just make out the olive kebab in the photo with the rest of the olives (but barely, to be sure). Drooling is a sign of appreciation! Thanks. I’m insanely jealous! Looks like you had such a wonderful time enjoying the hospitality of Catalunya~ Great photos and overview of the area! Hi Irene – It was definitely a huge treat in more ways than food! Fabulous that you were able to enjoy so much of the Costa Brava culture on your trip. I would loved to have stayed for a few more weeks, alas I am back in Austin and back to work. 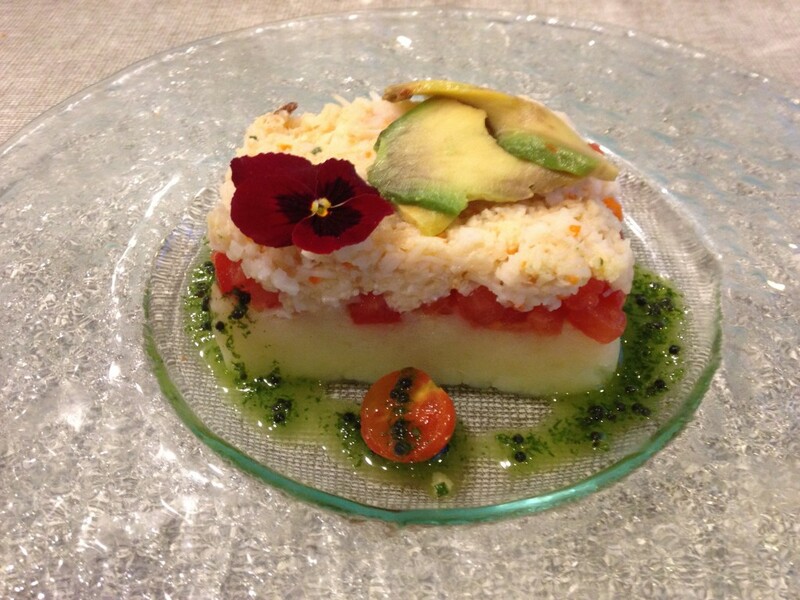 I will return to explore the region and try more of the tasty dishes, as in your photos! Almost too much info to take in all at once. This last trip was maybe our fifth to the Costa Brava-northern Catalunya area. Every time I go, I come back about 5 kilos heavier. But happier. It’s a wonderful place. Hi Tom – It sure is. We’re still digesting, but we’ve had enough to know we’ll be back. Oh Betsy what a marvelous post! 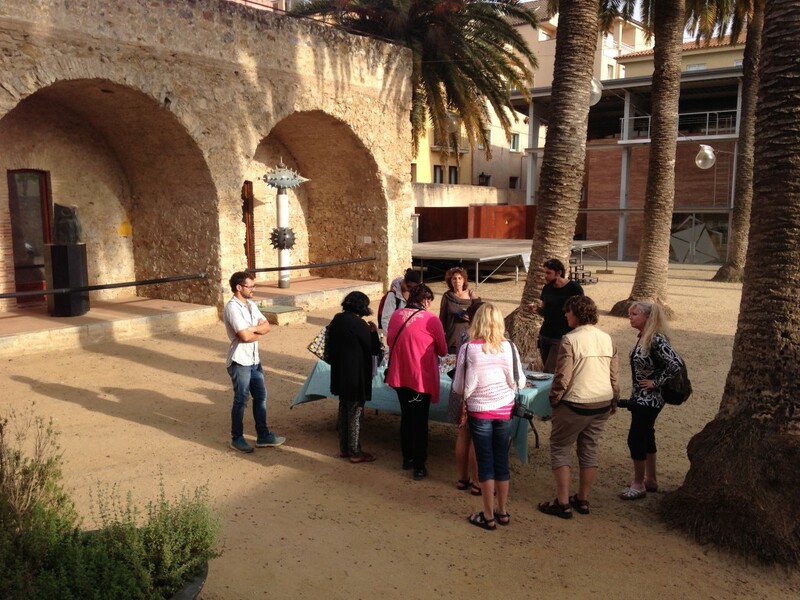 I am so eager to return to the Costa Brava…and would love to do this exact tour! I had to pause and take a few more bites of lunch before reading and looking at the mouth-watering photos! Hi Anne – It’s really a remarkable place in so many ways, isn’t it? Glad you enjoyed it. 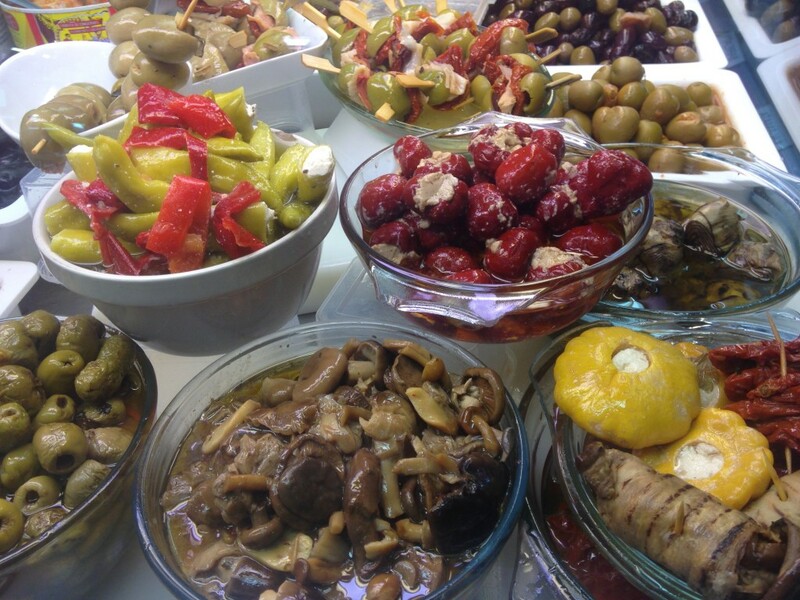 I love the food of Catalonia – so fresh and tasty. Your post – and the pictures – make me want to go back! Hi Karen – Let’s do it! Such lovely foods! 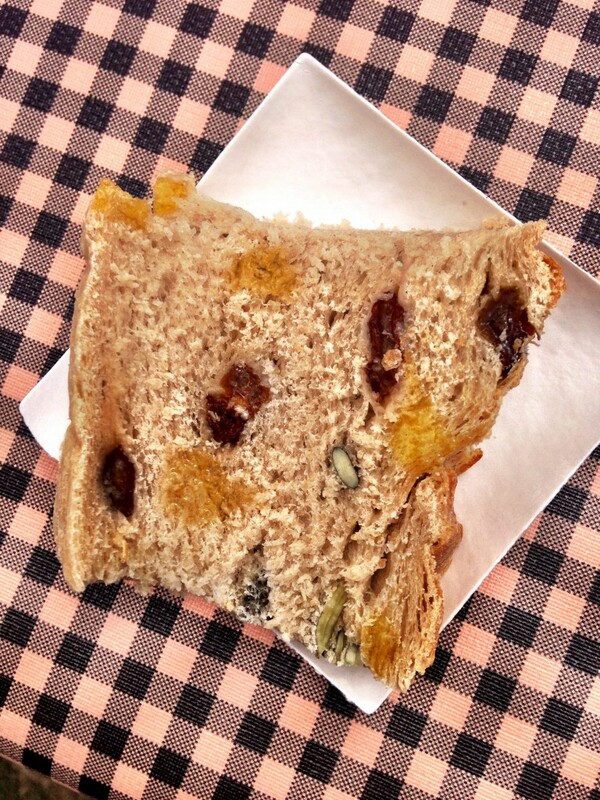 I especially like the olive spread and that chicken with prunes and apricots. They look delightful. Hi Carole – It was all beyond yummy into sublime. Thanks. What an interesting article! All the food looks delicious; it was fun to read about your adventure! Hi Marilyn – Thank you so much. Glad you liked it! Really should have read this AFTER breakfast. What a lovely depiction of the cuisine in Costa Brava. Now I’m going to be looking at my yogurt and granola and wishing I were in Spain.